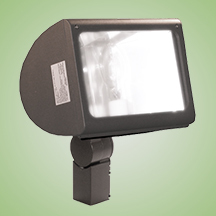 The RBF Flood Light is a compact HID light ideal for site, landscape, flag pole, and general security lighting. The sleek curve and contemporary look make them more aesthetically pleasing than regular commercial floods. A number of shielding options are available for customized effects. Made with a state of the art high performance reflectors that use high gloss components to achieve a precise photometric distributions. It is designed to produce a variety of symmetrical patterns to cover large areas with uniformity. Available with horizontal flood, vertical flood, and horizontal spot reflector systems. Available in 50W thru 175W standard metal halide, pulse-start metal halide, mercury vapor, high pressure sodium and 42W 120V fluorescent. Comes standard with a 4KV pulse rated medium base socket (HID models). Each 60HZ CWA Multi-Tap1 or 480V ballast is pre-wired and installed for convenience.